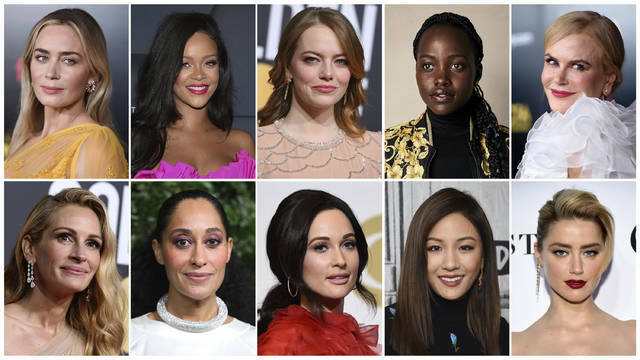 This combination of photos shows entertainers, from top left, Emily Blunt, Rihanna, Emma Stone, Lupita Nyong’o, Nicole Kidman, and bottom from left, Julia Roberts Tracee Ellis Ross, Kacey Musgraves, Constance Wu and Amber Heard, who were named Hollywood’s most stylish stars by People Magazine. The magazine is on newsstands Friday. This combination photo shows, from left, Timothee Chalamet, Donald Glover and Jeff Goldblum, who were named Hollywood’s most stylish stars by People Magazine. As for men, Timothee Chalamet is considered a trendsetter. Donald Glover’s style is throwback while Jeff Goldblum’s is eccentric. People magazine calls Henry Golding the gentleman.